Attar SM, Siddiqui AM. Vitamin D Deficiency in Patients with Systemic Lupus Erythematosus. Oman Med J 2013 Jan; 28(1):42-47. Studies have shown that the majority of patients with SLE have 25(OH)D deficiency when compared with controls.7-9 Furthermore, other studies recently reported a positive association between SLE activity and 25(OH)D deficiency.4,10-13 Only one study evaluated the association between 25(OH)D deficiency and SLE in Saudi patients, and it was found that deficiencies in 25(OH)D were common in these patients.5 Therefore, we decided to address this issue further through assessing the relationship between 25(OH)D levels and SLE disease activity, skin manifestations, lupus nephritis (LN), anti-double-stranded DNA autoantibodies (anti-dsDNA), complements, glucocorticoid exposure, and the use of antimalarial agents and Azathioprine (AZA) at a tertiary center in the western region of Saudi Arabia. A retrospective inspection cohort study was conducted to determine the relationship between 25(OH)D and disease activity in patients with SLE, who were diagnosed and followed up at King Abdulaziz University Hospital (KAUH), Jeddah, from January 2007 to November 2010. The study was approved by the Biomedical Ethics Research Committee at King Abdulaziz University (KAU). 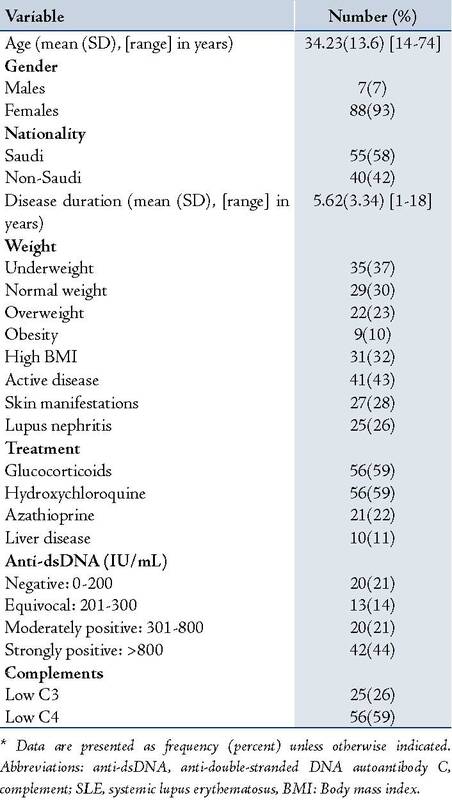 All cases of SLE diagnosed by a rheumatologist according to the 1997-revised American College of Rheumatology classification criteria were included.14 For all patients included in this study, we collected the following information: age; gender; nationality (Saudi and non-Saudi); duration of the disease; body mass index (BMI); disease activity; skin manifestations (malar rash and photosensitivity); history of lupus nephritis (LN); long-term steroid use >60 days15; use of steroid sparing agents (AZA or antimalarial agents as HCQ); anti-dsDNA and complement serum levels; as well as 25-hydroxyvitamin D [25(OH)D] levels. We also reported associated liver diseases, malabsorption and anticonvulsant use, which may contribute to 25(OH)D deficiency. Body mass index was calculated as weight in kilograms divided by height in meters squared and classified per WHO classification for obesity in 2000, into: optimal weight if the BMI was 18.5-25 kg/m2, underweight if the BMI <18.5 kg/m2, overweight if the BMI was 25-30 kg/m2, and obesity if >30 kg/m2.16 As patient on long term steroids and protein-urea will have a high BMI; high BMI that includes both overweight and obesity was added. Systemic lupus erythematosus disease activity was measured by the modified SLE Disease Activity Index 2000 (SLEDAI-2K).17 It is a weight pointed questionnaire that defines persistently active disease within 10 days of evaluation. It ranges from 0-109 points, and it involves both clinical and laboratory parameters. Active SLE was considered if the SLEDAI2K score was more than 4, and inactive if it was less than 4. SLEDAI-2K was calculated the same time that 25(OH) was measured. Any of the following definitions were considered to be lupus nephritis as not all LN patients were on second line immunosuppression and even the choice of second line may differ in Class V LN: proteinurea, red blood cell casts, serum creatinine >120 mmol/L or estimated glomerular filtration rate <89 ml/min per 1.73 m2 of body surface area.14 All patients who were on dialysis were excluded. Anti-dsDNA test was performed using the enzyme-linked immunosorbent assay (ELISA) technique (Quanta Lite,™ dsDNA Kit, INOVA Diagnostic Inc, CA, USA), and it was measured in IU/mL. Based on the manufacturer’s instructions, results of anti-dsDNA tests were classified as follows: 1) negative if the level was between 0-200 IU/mL; 2) equivocal if the level was between 201-300 IU/mL; 3) moderately positive if the level was between 301-800 IU/mL; and 4) strongly positive if the level was >801 IU/mL. Complement components 3 and 4 (C3 and C4) were measured by nephelometry, and hypocomplementemia was defined as a level below the lower normal value (C3 <0.75 mg/L and C4 <0.2 mg/L). Serum 25(OH) D was measured using ELISA technique (K2110, immuno diagnostic [Dutch Company], Holland), which evaluates the total vitamin D levels, both the D2 and D3 forms. It measures both the D2 and D3 derivatives of 25(OH)D. Vitamin D deficiency was defined as serum 25(OH)D level <50 nmol/L; severe if 25(OH)D <25 nmol/L, and normal when 25(OH)D >75 nmol/L. Statistical analysis was carried out using the Statistical Package for Social Sciences (SPSS) Version 18. Qualitative data were presented as numbers and percentages. Chi square testing was used to analyse group differences for qualitative data. Odds ratio and 95% confidence interval were calculated to estimate the risk. Quantitative data were expressed as means and standard deviation. Student’s t-test and ANOVA were used for continuous variables. ANOVA test was followed by Bonferroni correction. Log transformation was done for 25(OH)D. For correlation analysis, Pearson tests were used accordingly. Least significance difference (LSD) was used to compare between each two groups if (F-test) revealed significant differences. A p-value <0.05 was considered significant. A total of 95 patients were enrolled in the study. Table 1 shows the patients’ demographic and clinical characteristics. The mean (SD) age was 34 (13.6) years (range: 14-74 years). Females accounted for 93% of the study population (n=88). Fifty-eight percent of the patients (n=55) were Saudis. Mean 25(OH)D in male SLE patients was 31.43(26.25), and 28.71(18.86) in female patients, there was no statistically significant difference between the two groups (p=0.7). The mean SLEDAI-2K score at 25(OH)D measurement was 4 (+2.78) points (range: 1-12 points). Forty-one patients (43%) had active disease at the time of diagnosis; 54 (57%) had inactive disease. Skin manifestations were documented in 27 of 95 patients (28%); malar rash accounted for 85% (24/27) and photosensitivity for 56% (15/27) of the cases. Lupus nephritis was detected in 25 patients (26%). Glucocorticoid and HCQ users accounted for 59% of the patients (n=56); 21patients (22%) were AZA users. For the AZA, 14 patients (67%) were taking it as a steroid sparing agent and 7 patients (33%) as second line management. Ten patients (11%) had associated liver disease representing the following: a patient hepatitis C virus infection, 2 patients with fatty liver, 3 patients with autoimmune hepatitis, and 4 patients with drug induced hepatitis. No patient had malabsorption and none was taking anticonvulsant medication. In terms of the association between 25(OH)D levels and SLE activity; the mean 25(OH)D level of the patients was 23.9 (14) nmol/L (range: 2-49 nmol/L). Eighty-three patients (87%) were deficient in 25(OH)D. Amongst these patients, 46 (48%) had 25(OH)D levels <25 nmol/L. 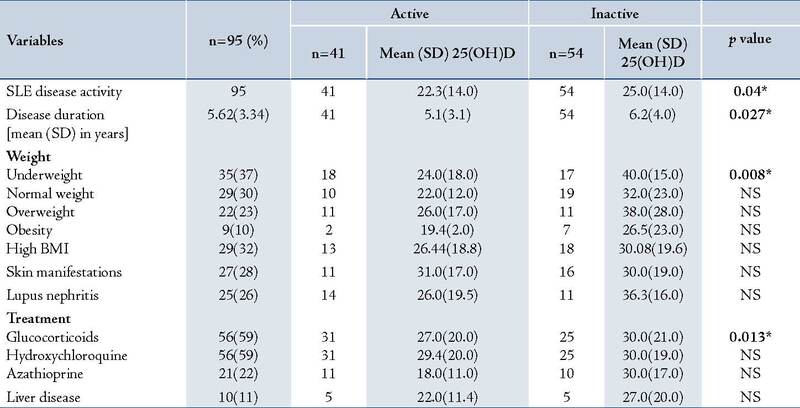 Twenty-five hydroxyvitamin D deficiency was found in 37 of 41 patients (90%) who had active SLE and in 46 of 54 patients (85%) who had inactive SLE. The mean 25(OH)D in patients with active SLE was 22.3 (14) nmol/L (range: 2-48 nmol/L), and in patients with inactive SLE it was 25 (14) nmol/L (range: 2-49 nmol/L; p=0.04). No correlation was observed between 25(OH)D and disease activity score evaluated by SLEDAI-2K. While for the association between 25(OH)D levels and variables; Table 2 shows the demographic, clinical and immunological variables that were associated with the levels of 25(OH)D. By chi square testing, patients with SLE presented a high risk of developing 25(OH)D deficiency if the following factors were present: AZA treatment (OR=3.5), low C4 (OR= 2.23), low C3 (OR=1.92), and active disease (OR=1.6). By Pearson correlation coefficient, there was a significant positive correlation between 25(OH)D and C4 (r=0.25; p=0.014) but not with C3 (r = 0.14; p=0.191). A significant negative correlation also existed between 25(OH)D and anti-dsDNA levels (r=-0.38; p<0.001). Table 4 shows the mean 25(OH)D according to different variables in the patients with active and inactive disease. Patients with active disease had lower mean 25(OH)D levels than those with inactive disease (p=0.04), and they were affected by all the clinical variables. The mean 25(OH)D levels in the patients with active disease were also significantly lower in underweight subjects (p=0.008) and in those on prolonged steroid treatment (p=0.013). Abbreviations: C, complement; CI, confidence interval; OR, odds ratio. * Data are presented as frequency (percent) unless otherwise indicated. Table 3: Level of 25(OH)D According to Anti-double-stranded DNA Autoantibody Titers. Abbreviations: CI, confidence interval. Tests of significance were done after log transformation least significance difference between (1) and (3), (1) and (4), (2) and (3), and (3) and (4) (p≤0.05) and after Bonferroni correction (p≤0.05). Table 4: Mean 25(OH)D Levels According to Different Variables in Patients With Active and Inactive Disease. Data from this study showed that the frequency of 25(OH)D deficiency among patients with SLE was 87%. We detected 25(OH)D deficiency in 90% of the patients who had active SLE and in 85% of the patients who had inactive disease. The mean 25(OH)D level was lower in patients with active disease than in those with inactive disease, 22.3 (14) nmol/L as compared with 25 (14) nmol/L in patients with inactive disease (p=0.04). In addition, patients who had active disease, low serum C3 and C4 levels, and AZA users had a high risk of developing 25(OH)D deficiency. Decreased levels of serum 25(OH)D have been documented in patients with SLE across various geographic locations and latitudes.4-13,18-22 Multiple risk factors have been associated with this deficiency, namely: sun avoidance as sunlight flares SLE; LN due to decreased 1-alpha-hydroxylase activity on 25(OH)D, leading to decreased synthesis of 1,25(OH)2D; use of drugs like GC, HCQ, and anticonvulsants that enhance 25(OH)D metabolism; and the presence of autoantibodies against vitamin D that probably contribute to its clearance.23-25 Another important factor is female gender as SLE and other autoimmune diseases are more common in females than males. In Saudi Arabia, 25(OH)D deficiency was observed to be as common as (80%) of the healthy women; in addition, females tend to have lower levels than males.26,27 The frequency of 25(OH)D deficiency among patients with SLE in our study is similar to that reported in other studies conducted in Saudi Arabia (89.7%), Norway (82%), and Poland (71%).8,11,25 However, much lower rates have been reported by other authors in Canada (18%), Hong Kong (27%), United States (20%), and Spain (15%).9,13,18,19 The mean serum level of 25(OH)D [23.9 (14) nmol/L] in our patients was much lower than those reported by other authors.7,9-11,13,25 Contrary to previous studies, which reported severe 25(OH)D deficiency in 18-21% of patients with SLE,4,7 the frequency of severe 25(OH)D deficiency in our patients was higher; 48% of our patients had severe deficiency (25(OH)D<25 nmol/L). Based on our literature search, this is the first study to evaluate 25(OH)D deficiency in patients with SLE as well as correlate the deficiency with other clinical variables (SLE disease activity, skin manifestations, lupus nephritis, anti-dsDNA, complements, glucocorticoid exposure, and use of antimalarial agents and AZA) in an Arab country. However, our study has few limitations, namely; lacking a control group to assess the frequency of 25(OH)D deficiency in the general population. In Saudi Arabia, a recent study on patients with SLE showed that low levels of 25(OH)D were detected in 55% of the adult control sample.8 When compared with the results of that study, the frequency of 25(OH)D deficiency was higher in our cohort than in the normal population. In addition, our results showed an absence of association with SLEDAI-2K scores and association with some serological markers. The possible hypothesis behind this could be the score included both clinical and serological markers and due to the retrospective nature of the study, some of the clinical findings could be missed and the SLEDAI-2K score may be lower. For that, we recommend a prospective study evaluating the disease activity with SLEDAI-2K and examining its correlation with 25(OH)D, as the score will be higher and a correlation may exist. In summary, 25(OH)D deficiency is common in patients with SLE. Although no correlation existed between 25(OH)D and active disease evaluated by the SLEDAI-2K score, it was observed between 25(OH)D and C4, as well anti-dsDNA levels. Active disease, low serum C3 and C4 levels, and AZA use are factors that are associated with a risk of developing 25(OH)D deficiency in patients with SLE. The authors reported no conflict of interest and this research was not supported or funded by any drug company. The authors would like to thank Dr. Bassem Al-Deek (Professor of Community Medicine) for his help in statistical analysis. 1. Holick MF. Vitamin D deficiency. N Engl J Med 2007 Jul;357(3):266-281. 2. Dusso AS, Brown AJ, Slatopolsky E, Vitamin D. Vitamin D. Am J Physiol Renal Physiol 2005 Jul;289(1):F8-F28. 3. Veldman CM, Cantorna MT, DeLuca HF. Expression of 1,25-dihydroxyvitamin D(3) receptor in the immune system. Arch Biochem Biophys 2000 Feb;374(2):334-338. 4. Ben-Zvi I, Aranow C, Mackay M, Stanevsky A, Kamen DL, Marinescu LM, et al. The impact of vitamin D on dendritic cell function in patients with systemic lupus erythematosus. PLoS One 2010;5(2):e9193. 5. Becker A, Fischer R, Schneider M. [Bone density and 25-OH vitamin D serum level in patients with systemic lupus erythematosus]. Z Rheumatol 2001 Oct;60(5):352-358. 6. Huisman AM, White KP, Algra A, Harth M, Vieth R, Jacobs JW, et al. Vitamin D levels in women with systemic lupus erythematosus and fibromyalgia. J Rheumatol 2001 Nov;28(11):2535-2539. 7. Kamen DL, Cooper GS, Bouali H, Shaftman SR, Hollis BW, Gilkeson GS. Vitamin D deficiency in systemic lupus erythematosus. Autoimmun Rev 2006 Feb;5(2):114-117. 8. Damanhouri LH. Vitamin D deficiency in Saudi patients with systemic lupus erythematosus. Saudi Med J 2009 Oct;30(10):1291-1295. 9. Toloza SM, Cole DE, Gladman DD, Ibañez D, Urowitz MB. Vitamin D insufficiency in a large female SLE cohort. Lupus 2010 Jan;19(1):13-19. 10. Amital H, Szekanecz Z, Szücs G, Dankó K, Nagy E, Csépány T, et al. Serum concentrations of 25-OH vitamin D in patients with systemic lupus erythematosus (SLE) are inversely related to disease activity: is it time to routinely supplement patients with SLE with vitamin D? Ann Rheum Dis 2010 Jun;69(6):1155-1157. 11. Szodoray P, Tarr T, Bazso A, Poor G, Szegedi G, Kiss E. The immunopathological role of vitamin D in patients with SLE: data from a single centre registry in Hungary. Scand J Rheumatol 2011 Mar;40(2):122-126. 12. Mok CC, Birmingham DJ, Leung HW, Hebert LA, Song H, Rovin BH. Vitamin D levels in Chinese patients with systemic lupus erythematosus: relationship with disease activity, vascular risk factors and atherosclerosis. Rheumatology (Oxford) 2012 Apr;51(4):644-652. 13. Mok CC, Birmingham DJ, Ho LY, Hebert LA, Song H, Rovin BH. Vitamin D deficiency as marker for disease activity and damage in systemic lupus erythematosus: a comparison with anti-dsDNA and anti-C1q. Lupus 2012 Jan;21(1):36-42. 14. Petri M, Magder L. Classification criteria for systemic lupus erythematosus: a review. Lupus 2004;13(11):829-837. 15. Curtis JR, Westfall AO, Allison J, Bijlsma JW, Freeman A, George V, et al. Population-based assessment of adverse events associated with long-term glucocorticoid use. Arthritis Rheum 2006 Jun;55(3):420-426. 16. Pi-Sunyer FX. Obesity: criteria and classification. Proc Nutr Soc 2000 Nov;59(4):505-509. 17. Gladman DD, Ibañez D, Urowitz MB. Systemic lupus erythematosus disease activity index 2000. J Rheumatol 2002 Feb;29(2):288-291. 18. Thudi A, Yin S, Wandstrat AE, Li QZ, Olsen NJ. Vitamin D levels and disease status in Texas patients with systemic lupus erythematosus. Am J Med Sci 2008 Feb;335(2):99-104. 19. Ruiz-Irastorza G, Egurbide MV, Olivares N, Martinez-Berriotxoa A, Aguirre C. Vitamin D deficiency in systemic lupus erythematosus: prevalence, predictors and clinical consequences. Rheumatology (Oxford) 2008 Jun;47(6):920-923. 20. Borba VZ, Vieira JG, Kasamatsu T, Radominski SC, Sato EI, Lazaretti-Castro M. Vitamin D deficiency in patients with active systemic lupus erythematosus. Osteoporos Int 2009 Mar;20(3):427-433. 21. Kim HA, Sung JM, Jeon JY, Yoon JM, Suh CH. Vitamin D may not be a good marker of disease activity in Korean patients with systemic lupus erythematosus. Rheumatol Int 2011 Sep;31(9):1189-1194. 22. Cusack C, Danby C, Fallon JC, Ho WL, Murray B, Brady J, et al. Photoprotective behaviour and sunscreen use: impact on vitamin D levels in cutaneous lupus erythematosus. Photodermatol Photoimmunol Photomed 2008 Oct;24(5):260-267. 23. Carvalho JF, Blank M, Kiss E, Tarr T, Amital H, Shoenfeld Y. Anti-vitamin D, vitamin D in SLE: preliminary results. Ann N Y Acad Sci 2007 Aug;1109:550-557. 24. Le Goaziou MF, Contardo G, Dupraz C, Martin A, Laville M, Schott-Pethelaz AM. Risk factors for vitamin D deficiency in women aged 20-50 years consulting in general practice: a cross-sectional study. Eur J Gen Pract 2011 Sep;17(3):146-152. 25. Bogaczewicz J, Sysa-Jedrzejowska A, Arkuszewska C, Zabek J, Kontny E, Wozniacka A. Prevalence of autoantibodies directed against 1,25(OH)2D3 in patients with systemic lupus Erythematosus. 2010 Feb; 28(164):103-7. 26. Ardawi MS, Qari MH, Rouzi AA, Maimani AA, Raddadi RM. Vitamin D status in relation to obesity, bone mineral density, bone turnover markers and vitamin D receptor genotypes in healthy Saudi pre- and postmenopausal women. Osteoporos Int 2011 Feb;22(2):463-475. 27. Elshafie DE, Al-Khashan HI, Mishriky AM. Comparison of vitamin D deficiency in Saudi married couples. Eur J Clin Nutr 2012 Jun;66(6):742-745. 28. Walport MJ. Complement and systemic lupus erythematosus. Arthritis Res 2002;4(Suppl 3):S279-S293. Published online 9 May 2002. 29. Egner W. The use of laboratory tests in the diagnosis of SLE. J Clin Pathol 2000 Jun;53(6):424-432. 30. Lane NE. Vitamin D and systemic lupus erythematosus: bones, muscles, and joints. Curr Rheumatol Rep 2010 Aug;12(4):259-263. 31. Kamen DL. Vitamin D in lupus - new kid on the block? Bull NYU Hosp Jt Dis 2010;68(3):218-222. 32. Hanley DA, Cranney A, Jones G, Whiting SJ, Leslie WD, Cole DE, et al. Guidelines Committee of the Scientific Advisory Council of Osteoporosis Canada. CMAJ 2010 Sep;182(12):610-618 .